It all started with the dodge button. Blizzard added that to Diablo III when bringing it to the PlayStation 3 and Xbox 360 in 2013. Dodging was a great feature, but it wasn't enough to make me switch my allegiance from playing on a PC. Now that Diablo III is out for the PS4 and Xbox One, it's a different story. I've played a lot of Diablo III in a lot of different ways since it first came out in 2012. I've played on PC and Mac, PlayStation 3 and Xbox 360. I've experimented with all of the character classes (the Witch Doctor is the best by far, no matter what our latest poll says), and tested the game across different difficulties alone and with other players. But it wasn't until I played the newly-minted PS4 version of Diablo III that I started to feel like I'd discovered the best possible version of the game—the one that launches today for Microsoft and Sony's newest consoles. Now that I have, I think I can finally sit back and enjoy the game without worrying if I'm missing some other, better version of Diablo III. See, even when Diablo III wasn't a console game, it still felt like one. Blizzard made a lot of big changes in the twelve years it took to produce a sequel to Diablo II. The most controversial adjustments were the ones that simplified character customization and abilities by removing some of the minutiae of skill trees and only given players access to a handful of special abilities at any given time. A lot of Diablo purists hated this because, as Mike Fahey put it in our original review, the tweaks meant the game was "a bit on the easy side, especially for players who have followed the series for any extended period of time." I was one of the people who recoiled in fear and disgust when I first saw how Diablo had changed in its third act. But even then, I remember thinking that there might just be a silver lining. Maybe Blizzard didn't want Diablo III to just be an epic clickfest like its two predecessors. You could only use four abilities at any given time, after all—a number that seemed destined to be matched with a gamepad or two. So maybe the company thought it could also capture some of the magic that gamers remembered from playing games like Gauntlet: Dark Legacy together back in the glory days of the PlayStation 2. Then it could make up for whatever Diablo III sacrificed in depth and complexity by offering amazing couch co-op instead. I don't have any special window into the minds of the people who made Diablo III. But regardless of Blizzard's original intentions, the game began to evolve when it was first ported to then-current-gen consoles back in September 2013. Longtime fans didn't welcome the shift with open arms, but something about the game just felt right when I revisited it on the Xbox 360. It scratched that same itch as the old Gauntlet games of yore. At the same time, however, Diablo III didn't look nearly as good on the PS3 and Xbox 360 as it did on the PC. This is the one major problem I had with the 2013 console ports. Thankfully, it's also one that Blizzard was eager to fix. 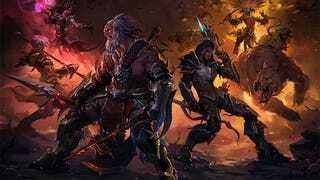 There are a number of small improvements and adjustments that have been made to the Xbox One and PS4 versions, but the jump in visual fidelity is really what transformed the game from a promising experiment into the definitive edition of Diablo III for me. I swapped back and forth between my old Xbox 360 version and the new PS4 game when I was playing at one point this weekend, and didn't have a hard time appreciating just how much better it looks on a current-gen system. All the rough pixelated edges have been rubbed smooth, and the new game has a much richer and more subtle color palette than what I saw on my 360. It felt like I'd gone from playing the game on an outdated graphics card to the latest and greatest model I could find. Of course, "the latest and greatest" means something very different for console and PC gamers, respectively. There are PC rigs out there that could do laps around the PlayStation 4 when running Diablo III. But the PS4 version of the game still looks good enough that it can hold its own against pretty much any other game I've played on the console so far, which is the more important question as far as console gamers are concerned. Also, the game works perfectly with the DualShock 4. You assign special attacks and other abilities to two of the face buttons and two of the controller's shoulder buttons, which makes the actual gameplay feel a lot like you're executing combos in a beat-'em-up style game like God of War or Remember Me. My favorite part of playing Diablo III on the PS4 is how you move with the two joysticks. The left stick is the main way to steer your character around the map, and you can adjust his or her speed depending on how hard you're pressing it in any given direction. The right joystick, meanwhile, is how you dodge. Simply flicking it in any direction will send your character tumbling. This seemed like a minor addition at first, but it soon became one of my favorite tools to get out of a tense battle as fast as I could. Much like the good old fashion mouse-and-keyboard combo, the gamepad provides a familiar template regardless of what character you're playing with. But what I love in particular about the PS4 version of Diablo III is that the DualShock 4 really feels like a different beast depending on which class you choose. The Demon Hunter and Witch Doctor both have strong ranged attacks, which makes for a more distant, tactically-oriented style of gameplay. Melee-friendly grunts like the Barbarian and the Crusader, meanwhile, are what really give the game a new God of War-type vibe. The real fun begins when playing the Diablo III's excellent multiplayer, however. I wasn't able to test out much of the new version's online offerings prior to launch, but I can already tell that local co-op will be a major asset for the Xbox One and PS4 versions, just like it was for the 360 and PS3 ones. There's something inescapably charming about playing a game with someone else when you're sitting right next to them. And Diablo III isn't just any game. It's a massive world filled with countless nooks and crannies. As much as I loved the original PC version, exploring all of those avenues got lonely at times, even when I was playing online. I haven't sunk nearly as much time into the PS4 version of Diablo III as I have on the PC and Xbox 360. Playing the game over the past few days, I've only managed to make it partway through the first act—so I know I have a lot more monster-slaying and loot-hoarding ahead of me. But since I've already beaten the game many times over, I'm not in as much of a rush at this point. And that's a surprisingly good feeling to have about a Diablo game: it's something I'm looking forward of playing with friends at a more relaxed pace than I remember burning through the original PC game. Most importantly of all, then, the new game's control scheme is an incredibly comfortable one. That might sound silly at first. But after playing through three full Diablo games many times over, I didn't realize how relieved I was to be able to experience the game in a new way. However subtle the shift to a gamepad-style controller might seem, it made playing Diablo III a much more casual experience for me. And by doing that so well, it also made me realize that "casual" doesn't need to be such a bad thing. I wasn't hunched over my PC, I realized after I'd been playing for a few hours. I wasn't clicking endlessly to amass ever greater piles of loot. Instead, I was tapping an x button endlessly to amass ever greater piles of loot. It felt familiar, even repetitive at first. But just being able to sit back on my couch and do so with a friend made all the difference. UPDATE (4:15 pm): this article was originally published with the headline 'Diablo III Feels Like It Was Made For PS4.' I've now changed it to clarify that the improvements I identified aren't necessarily specific to the PlayStation 4 version of the game. As I explain in a comment on the original article, I only focused on the PS4 version of the game because that's the one I was able to test in preparation for this article. I did not intend to say anything about the Xbox One version of the game specifically in comparison to the PS4 version. Apologies for misleading anyone with the original headline.